School Holidays: So often, in the past, I've dreaded the school holidays. For our family, they usually spell a time of isolation. School is out and so we don't see other families, and our kids usually don't see much, if anything of their friends. This summer has been different. We went to friends for New Year's Eve, and we've also had several playdates with our boys' friends this summer. Through the miracle of technology the boys have stayed in contact with classmates online as well. Technology has featured prominently this summer and while I readily accept I've previously viewed children and technology with a jaundiced eye, this summer I've had to eat humble pie while calculating the benefits versus the drawbacks. For us, this summer, the benefits of technologies has far outweighed the drawbacks. Friends: I've been fortunate enough to catch up with a few friends this summer. Hours spent with like-minded people just hanging out, chatting, and watching the kids play has kept me sane! Getting physical: I was also fortunate enough to be able to help a friend in the process of moving. Carrying furniture and boxes from here to there, washing walls and windows, simply working hard and being tired at the end of it really helped. It stopped me from dwelling on my own concerns and I was able to measure real progress at the end of the day. I said this last week, but I'll say it again - being useful to someone gave me a sense of belonging and self-esteem which has been lacking for a while. Family: Having my parents come and stay for a few days actually 'felt' like a holiday to me! It was so lovely to have them here and to fill the dinner table each night and have that sense of extended family. I wish we could do it far more often, but I'm very thankful for being able to do it all! Crocheting: I finally finished my afghan! It look FABULOUS if I say so myself - and I don't mind saying so myself at all. I'm so pleased with it! I'm so happy with myself for finishing it, too! I find creating something immensely satisfying. In case you're concerned that I may have spent a lot of money on yarn, let me assure you, I didn't, This blanket cost about $10 in very cheap acrylic yarn from Big W. Some might turned their nose up at cheap acrylic but it suits my purposes extremely well because I just want to create and as it will be used in a high traffic area, it is bound to get spilt on and dragged about by the children. If I'd crocheted this out of organic bamboo or a silk blend, it would be too precious for me to enjoy using. So, it's cheap and cheerful and I gained all the joy of creating it over the past month as well! I've already begun on my next project! Minecraft Biosphere Mod: Yes, truly, I'm thankful for a games mod. It has brought a new perspective to a game my son and I have been enjoying together - as well as new challenges in lateral thinking and new rewards! And... 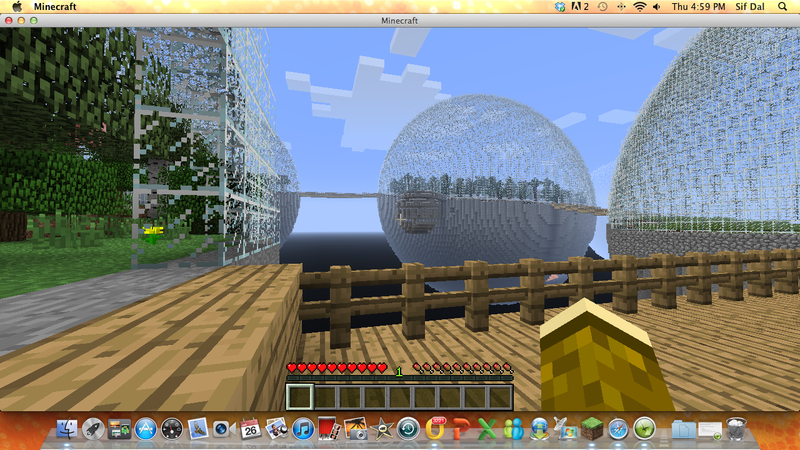 It's pretty... Each sphere has its own biome; forest, desert, swamp, mushrooms, even nether! Between the biomes are 'moons' and these mini spheres contain rare minerals (lapis lazuli and diamond). Knowing exactly where to mine for diamonds is fabulous. The challenge is to get to the moons without falling into space and dying - which we're overcoming because we're a brilliant team! We have over 30 diamonds now, woot! Overcoming fears: Just recently - like magic - my six year old has started sampling foods he'd previously not even liked to look at or smell. We're into our fifth year of living with and battling his food phobias. When he was very little he ate most things as long as they weren't the consistency of mashed banana (you know, slippery and mushy at the same time). but by the age of two he'd started to refuse foods. By the time he was three he was living off vegemite sandwiches, Weetbix and plain meats. He didn't like sauces, bakes, any kind of vegetable and would only eat apples. We've tried everything over the years from ignoring the situation and letting him just eat what he would, to attempting to bribe him, to giving him one option and letting him go hungry if he refused it (which ended in him vomiting every time). Suddenly a week or so ago he said he'd try some Chilli con Carne and he did, and he decided it wasn't that bad. Then another night he tried a bit of salad, then he tried some Chicken Tonight. Suddenly, he's decided to try foods and tells us most things are actually nicer than he thought they would be. I don't know what happened, I don't know what magic occurred, I just know I'm immensely thankful for this recent change and I really, really hope it lasts! Online writing communities and opportunities: Recently I've had many opportunities to connect with other writers online. It's been amazing! There are so many talented writers out there, and I feel inspired whenever I read what they are working on. As a writer, I can't work in isolation. I mean, I need a fair amount of isolation to write, but I also need a lot of sharing and hearing of ideas with other creators to feed my inspiration. The internet has made connecting with other writers so much easier and I'm so thankful that so many other writers are willing to share their work. I may not write in the same style as most everyone else, but from their ideas and their words I find my own creative worlds opening up. It's just beautiful! I've done more creative writing off my own bat in the past six months than ever before! What are you thankful for at the moment? What a great things bunch of things to be thankful for. That throw looks so awesome, go you for putting it altogether. Thanks Rhianna, I'm so very happy with it, it makes me smile every time I go into the lounge room! Right now I'm working on another cushion and then I have another blanket in mind after that - I'm totally hooked! I absolutely adore the afghan! It is beautiful and practical, my two favourite things lol. Loving that throw; the colours are beautiful! I love to create too, and have had much joy making library bags for the kids this week. Glad the holidays have been good for you Sif! What a lovely post. A real mixed bag of things to be thankful for. Love it. Glad you are so honest and open and real about where you are at. I so know about the enjoying holidays and the looking forward to going back to school thing. Life is constant pushing and pulling eh?